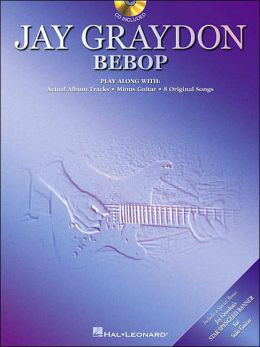 Jay Graydon. Official Web Site. Hot News! TRIBUTE ALBUM TO AL JARREAU! A musical tribute project produced by Chris Walker & Larry Williams, with special guests Jay Graydon, David Foster, Jerry Hey, Dave Koz, Arturo Sandoval, Greg Phillinganes, Paul Jackson Jr., Gary Grant, Chuck Findley, Bill Reichenbach, and many other greats. Larry Williams is one of my best friends. Larry called me noting he was working on a Jarreau tribute album and asked me if I would play the guitar parts on Mornin', which I did. The track is great as expected and the bass player (Chris) in Al's band is an outstanding singer and can sound like Al to the point it's scary! 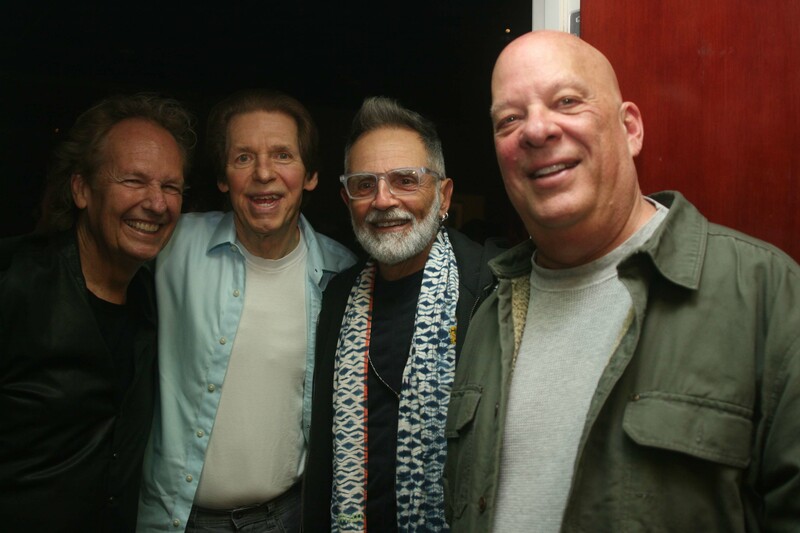 Larry was Al’s musical director for many years and Chris was his bass player and background singer for many years as well. I just played the full album now and was amazed as to how the songs have developed regarding the arrangements over the years! Outstanding musicians as expected. The album will be released May 17 and is available for pre-order at Chris Walker's website and here below are the tracks and featured artists on the album. SIX STRING SHOW feat. LEE RITENOUR! As you know Jay was one of the guitar judges in Lee Ritenour's Six String Theory Competition 2018 and recently Rit hosted a great evening of music presenting the winners of his 2018 Six String Theory Music Competition at the Catalina Jazz Club in Hollywood. It was an awesome night and Lee Ritenour was jamming with the winners - some incredible young talent from around the world! Jazz, Blues, Rock, Classical.... they covered it all! 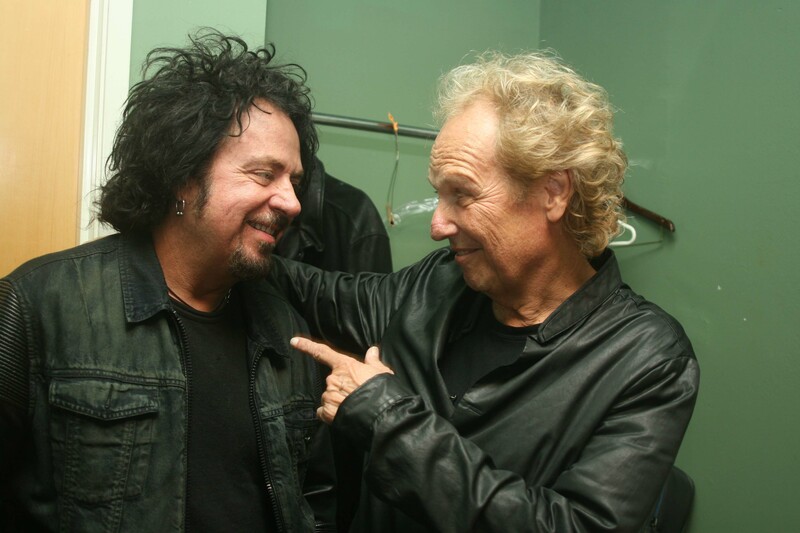 Check out the winners list 2018 on Lee Ritenour's Six String Theory website. Rit, Wes Ritenour on drums, the main bass player and keyboard player are contest winners (I think) and with Wes, they played with all the other guitarists, which all were outstanding! The winners are noted on the site for 6 string theory. The classical guitarist winner is a chick who is unbelievable!!!! Guitarists of my era that were there - Mitch Holder, Tim May, Thom Rotella, Pat Kelly. 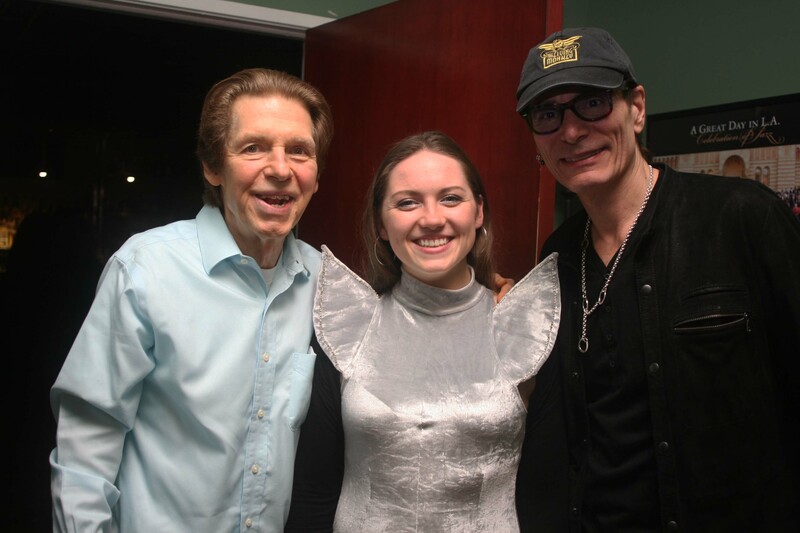 Me, Luke and Steve Vai sat together with our chicks (or wives). My voice over 1st call pal Scott Rummel sat with us as well. I got Bill Evans in but did not see him as too much was going on and just until the gig started, I was in the band room meeting the winners and hanging out with Rit, Luke, and Vai. Everyone played great and good to see my pals Rit, Luke, Steve Vai, Tim May, Mitch Holder, and Thom Rotella. Foz was there with Chris Botti, but I did not know until the next day when he called me. He saw me split with Scott and DML (about 15 minutes before the gig was over) and unfortunately I did not see him in the crowd. The gig was fun! Here below a few pics from the gig. (Click on the mini pic to get the full size). Photos © 2019. Denise Marie Luko (aka DML). All rights reserved. 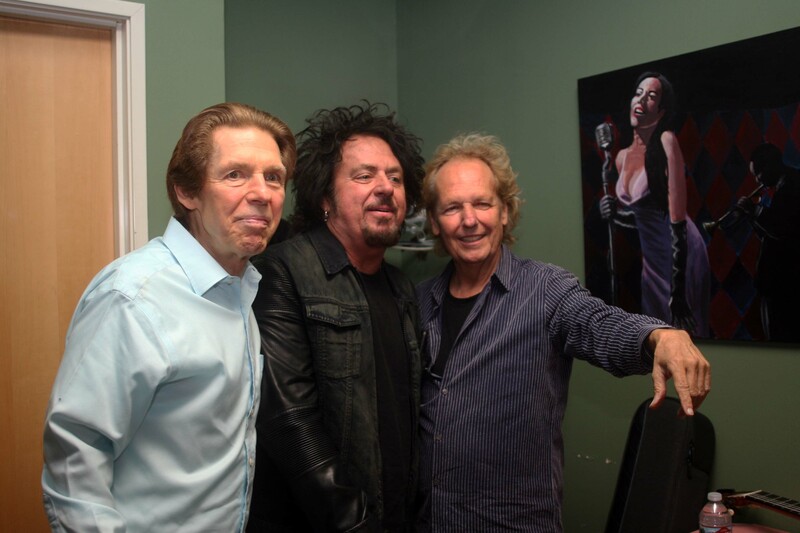 Guitar wizards Jay Graydon, Steve Lukather & Lee Ritenour meet at the Catalina Jazz Club, January 28, 2019. "Hey bro, let me look at you!" a closer look at each other. "... and you won't believe what happened next ..." Luke and Rit are having fun sharing stories from their tours. 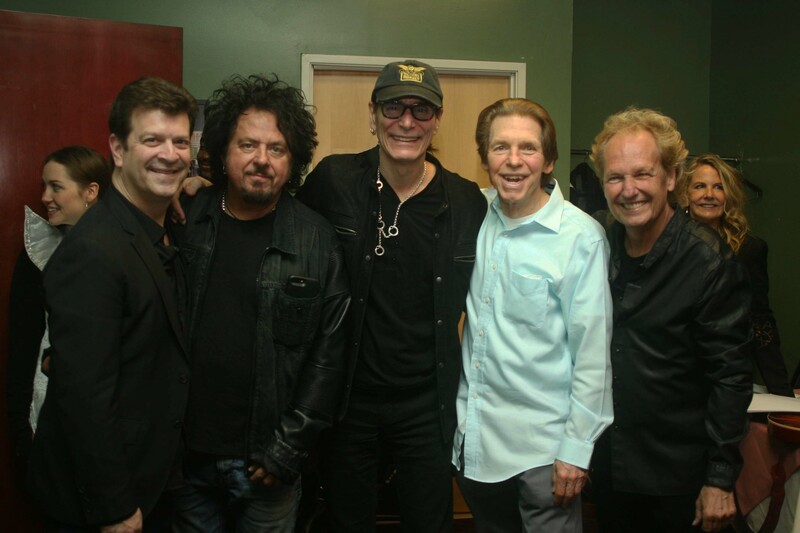 Hedvika, Dave Rosenthal (music director and keyboardist for Billy Joel), Luke, Vai, Jay, and Rit. Carmen (Rit's wife) to the right. Another monster line up of musical talent! Guitar virtuosos Lee Ritenour, Jay Graydon, Thom Rotella, and Tim May. wishing everyone Happy Holidays and a great new year!!! After having major tech problems this fall I am back to mixing the JaR 2 songs, as well as working on other projects. Most recently I have been playing on a Jarreau tribute album for Larry Williams that will come out next year. Further, we are getting close as to finishing mode of the first release of the "Famous E Piano" sample program. I did an interview with Tim Pierce a few weeks ago, which was filmed and in it I am teaching him how to play the PEG solo. If you are interested, you can watch it on his YouTube channel. "The Mutual Admiration Society" for Your Grammy Consideration! As many of you already know, Jay Graydon is a featured guitar player on the track "Strip Mall Gourmet" of this album below - The Mutual Admiration Society. "For Your Grammy Consideration: The Mutual Admiration Society, an album from Sterling Ball, @jim cox, and @john ferraro. Featuring some of the world’s greatest guitarists including @steve vai, @john petrucci, @steve lukather, @steve morse, @albert lee and Jay Graydon. #grammys #FYC"
Airplay remastering 2018 with 3 extra bonus tracks! All data on the songs, releasing label and cat.# is noted in Jay's discography. Here are a few notes from Jay on how he worked with the remaster this time around. Hi all of you who like the Airplay album or may have not heard this album, most of you know I have remastered the album a few times over the years. Each time I did so, there was always better electronic tools or Pro Tools plug-ins to use. For this current mastering, I spent 12 weeks as I wanted to reshape the whole sonic concept! In the late 70's and first half of the 80's, recordings had more upper midrange than they do now. One reason Airplay had a lot of upper mids (around 2k to 3k) was David and I thought we had over-produced the album as we had so many guitar and synth parts! The way to get a crowded album to have all parts heard is to add the mentioned frequency on many instruments and vocals. With the great Pro Tools 3rd party plug-ins such as the FabFilter EQ and Multi-band compressor (and many more plugs), I was able to totally reshape the sonics! I moved the 2 to 3k feature by having the FabFilter multi-band compressor set to tame the 2 to 3k, I used the FF EQ to do the same when needed automating all of the plug-ins as needed to get the sound I was looking for! Many of the songs needed more bass since in when using vinyl records, the bass creates a wider groove in the record and if the attack is real punchy, (the same for the bass drum), the "spike" could easily make the needle jump out of the groove! With digital audio, that problem does not exist! Let's back up for a moment. Around 7 months ago, Sony and I thought it would be a good idea to remaster. I think this is the first remastering that used the original 2-track tape instead of a tape copy since when pressing records in other countries, tape copies were made and sent to each country that would release the product. The original tapes are at Sony (I think in New York) and Sony Japan asked the tape be transferred to digital at 192k-24 bit, which occurred! After experimenting with a few songs, I realized Stranded (the 1st song) vocal level would be too low after adding the plug-ins for the total reshaping. One of my best friends is Bill Evans who is a total genius! As part of his PhD research, he created a new type of audio editing program called Belexes that uses augmented reality to explore and edit sounds in three dimensions. Every waveform you can see in a DAW such as Pro Tools can be broken down into millions of individual sine waves. Once this is done, sound can be edited in three separate dimensions: frequency, time, and amplitude. He now works on a commercial version, invented by his partner Robin Lobel, which runs in two dimensions on ordinary computers. It’s called SpectraLayers, and includes a feature they added for my own work. So back to Stranded. Since I needed the vocal to be as much 5 dB louder than it was, I asked Bill if he could remove the vocal from the instruments and send me both tracks. Actually to do this as good as possible, since there are vocal parts that overlap each other, There are 3 vocal tracks and an instruments track (all are obviously stereo tracks). Working with SpectraLayers and Steve Oliver at Audioamix (TRAX), Tom (Bill’s co-engineer) and Bill separated the three vocals to separate tracks. Here's the audio of a section of the song before separating the vocals, then a version with just the vocals, and then the full track with the instruments put back together with the new boosted level riding. JAY EXPLAINING THE PEG SOLO TO TIM PIERCE! A few weeks ago Jay's very good friend and an excellent guitar player, Tim Pierce, visited Jay in the studio for an interview on how to to play the iconic PEG solo, as well as chatting about the gear being used and the recording session with Donald Fagen and Walter Becker of the Steely Dan. Tim is now sharing the video from the event with all of you in his YouTube channel. Near the end of the video, I did not know Tim was going to use live guitar audio along with my recorded track of the solo. If I knew Tim was going to use my “jam along” audio with the track, I would have tuned up and played a few passes to make sure to get it in tune so please forgive the fact the pitch is not good. Also, the solo is a remake of the original as I have used it a few times in films and TV interviews. Since it costs big bucks to get a synch license from Warner Bros to use the original, I hired my very close friend, Jay Oliver (excellent keyboardist and composer), who is also outstanding as to re-creating sounds with samplers. etc. Unless the listener pays close attention, you might think this is the original Steely version! JAY JUDGING IN RIT'S SIX STRING THEORY COMPETITION! Once again Jay is one of the guitar judges in Lee Ritenour's Six String Theory Competition, You are welcome to participate in one of the categories - GUITAR, PIANO, BASS or DRUMS. The registration is open until May 31, 2018. Here is a video with Rit talking about the contest. BUSY NIGHTS IN THE STUDIO! It may seem very quiet around here, but the truth is Jay is working hard in the studio, and barely has time to come up for air. Here he is with a brief message to you all. The Japan gig with Foz is postponed due to scheduling problems. For previous news entries, please check out the News Archive.